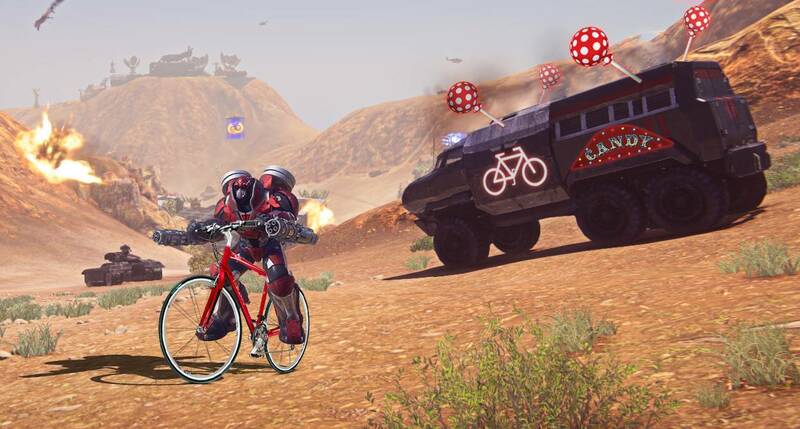 @planetside2 #neverhaveiever passed out bikes to wandering Max Units in my Candy sunderer. Who is this dedicated warrior of Twitter? Chosen Allegiance: The Terran Republic. Outfit: Validus Gamers. You can find them at www.validusgamers.com. What was your Inspiration: No inspiration. It comes from being crazy. What do you like most about PlanetSide 2: The ability to organize, control, and witness a massive war, to order hundreds of troops towards a common goal. What’s your current rig like: A patched up ASUS gaming laptop that is just holding together, and can barely run the game currently on Medium. I've been recording, editing, and gaming on it for a while now.I haven't had enough money to upgrade, so this Alienware desktop will help greatly. Anything else you’d like to share: I run a Youtube channel at www.youtube.com/ZoranTheBear. Over there I cover Planetside 2's weapons, vehicles, and its various aspects. I also showcase Outfit gameplay when my outfit holds Operations. PlanetSide 2 Developers Interviews Live!